If your company's email service is hosted by Excell IT, you can access your email from anywhere in the world with Internet access and a web browser (e.g. Internet Explorer, Google Chrome, Firefox, Safari, etc.). The Outlook Web App connects directly to the email server and grants you very similar functionality to Outlook and with a very similar interface. 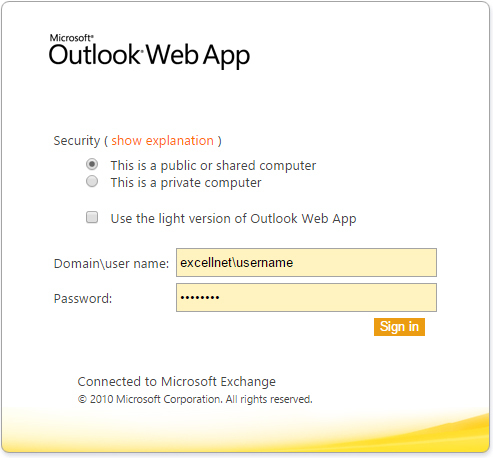 An easy way to get to the Outlook Web App is to go to the Excell IT website at www.excellit.com. In the main menu, click on Clients. From this page, you can click on the Continue to Hosted Outlook Web Access button and it will take you to the login page. In order to log in to OWA, you need to enter your email account credentials. If you do not know your credentials, please contact the Support Team at (905) 673-9692.